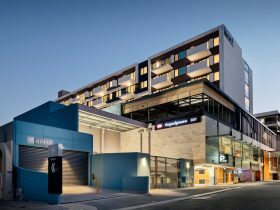 Comfort Hotel Perth City is conveniently situated in East Perth, just minutes walk to the central business district and offers great value, reliability and all the services and amenities you would expect from a hotel in this class. 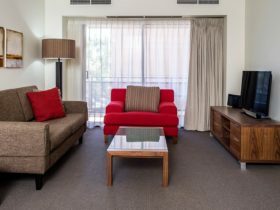 Offering standard, studio and family rooms ideal for corporate or leisure travellers, free public transport (CAT Bus) leaves nearby for quick and efficient city transport. 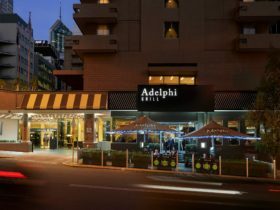 Modern accommodation in a superb location, along with excellent value and service await each guest. Standard rooms are comfortable, well presented and offer very reasonable prices. The Double Standard Rooms can accommodate up to two persons, with a bedding arrangement of one queen bed. The room size is 22.36 square metres. Please note, rollaway beds are not available for this room type. Studio Queen rooms are slightly more spacious and comfortable and at affordable prices. Ideal for guests willing to experience that extra comfort value. They accommodate up to two persons with a bedding arrangement of one queen bed. The room size is 25.35 square metres. Studio Amenities include the Club Lounge, business work station and chair. 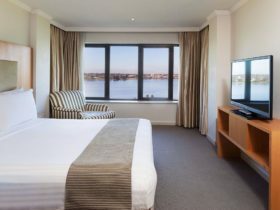 One rollaway bed is available for this room type for an extra AUD20 charge. Children under 12 years stay free of charge in existing bedding with parent(s). Standard rooms are comfortable, well presented and offer very reasonable prices. They accommodate up to two guests, with a bedding arrangements of two single beds. The room size is 22.36 square metres. King Studio Rooms are very spacious and comfortable at an affordable price. Ideal for guests wanting the best comfort of this hotel class. This room accommodates up to two persons, with a bedding arrangement of one king-size bed. The room size is 34 square metres. Studio amenities include a Club Lounge, business work station and chair. 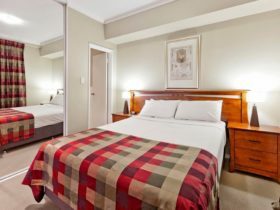 One rollaway bed can be made available, in this room type if required, for an extra AUD20 charge. Family rooms are spacious and at very reasonable prices. Ideal for guests travelling in bigger groups. The Family Rooms accommodate up to four people, with a bedding arrangement of one queen and two single beds. The room size is 42.14 square metres. Standard rooms are comfortable, well presented and offer very reasonable prices. 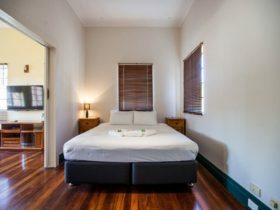 The Triple Rooms can accommodate up to three guests, with a bedding arrangement of one queen and one single bed, or three single beds. The room size is 23.5 square metres. Light start breakfast may be included seasonally.